I was at my local fitness Mecca trying out their wares on a seven day pass that I tend to take advantage of once a year. 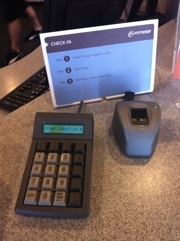 I saw this sitting on the table and I noticed that it was a new way of checking in. If you can’t tell from the picture, this is a fingerprint scanner that gives you access to your gym. The thing I immediately thought about is how convenient it would be to just place your index finger on a plate of glass and go on your merry way. Then, immediately, I thought about how little human interaction the process of going to a gym would require because of this device. You would be able to go in and not speak to a single person the entire time you were there. The check in process would be so individualized and automated that the level of error would be almost non-existent. I’m not sure I am ready to authenticate into a real place with biometrics. I’m fine for going somewhere digital and needing to prove who I am. In physical space, though, I expect to be recognized as a human. I never mind getting out an ID or badge or business card. It makes the process of introducing myself so much easier. I get the convenience. I just don’t see it as progress.